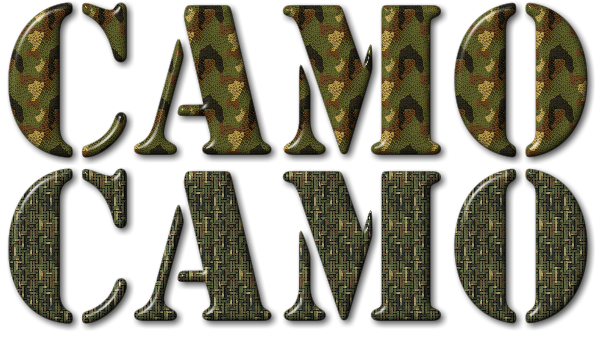 Where do you get a “camouflage font”? The key here is to fill the text of your choice with a camouflage pattern. Fonts by definition are a vector shape and can only have a solid fill. That doesn’t mean you can’t create the text in your favorite graphics software and use a camouflage fill. So now our original question has gone from a camouflage font to a camouflage fill. Look at the two samples above. Both started out with the Stencil font filled with black. Then each one was filled with a bitmap texture from the Textures Unleashed Volume 8 collection. The top sample uses the Camouflage Cloth and the bottom uses the Camouflage Netting. For our example, Corel PHOTO-PAINT was used, but this same fill can be used in most any graphics software. Yes, it is just as easy in CorelDRAW, Illustrator, Photoshop and more! To make each sample pop, the Bevel filter in Alien Skin’s Eye Candy was used. Corel PHOTO-PAINT users can try the included “The Boss” filter to get similar results. Lastly, a subtle drop shadow was added on each sample. In total, it took less than five minutes to create both of the samples shown. When you have a bunch of really cool bitmap patterns like those offered by Seamless Textures Unleashed, it isn’t hard to create cool stuff really quickly.